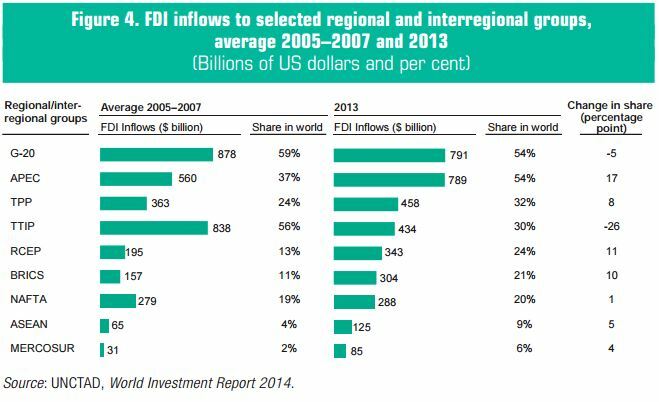 In 2013, FDI flows returned to an upward trend. Global FDI inflows rose by 9 per cent to $1.45 trillion in 2013. 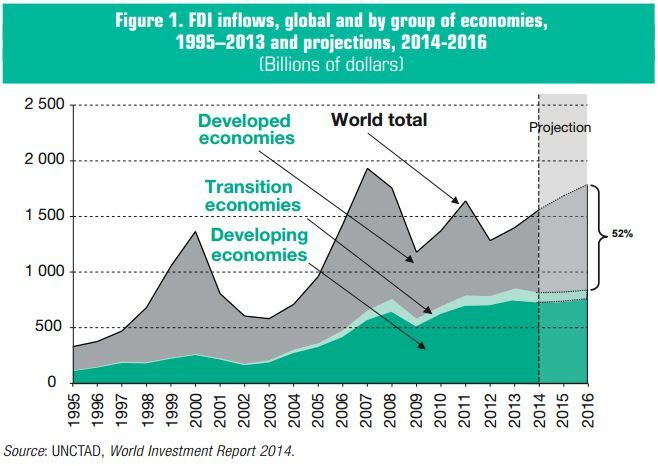 FDI inflows increased in all major economic groupings − developed, developing, and transition economies. Global FDI stock rose by 9 per cent, reaching $25.5 trillion. 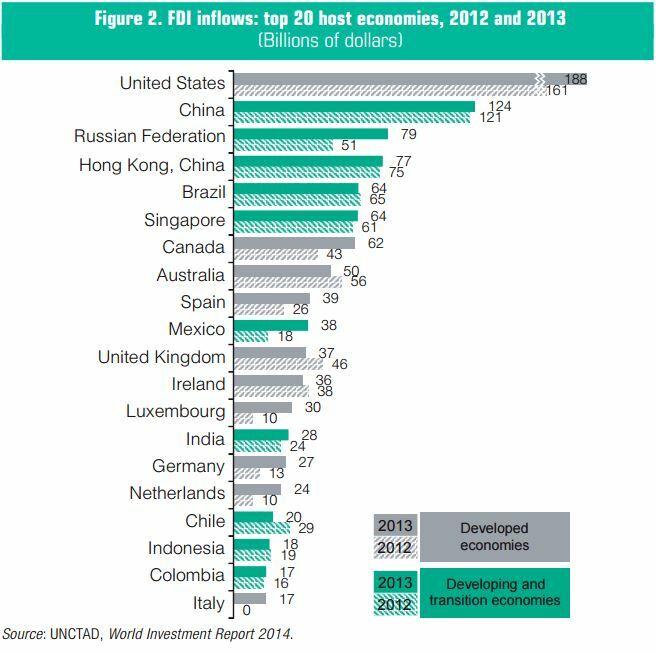 UNCTAD projects that global FDI flows could rise to $1.6 trillion in 2014, $1.75 trillion in 2015 and $1.85 trillion in 2016. The rise will be mainly driven by investments in developed economies as their economic recovery starts to take hold and spread wider. The fragility in some emerging markets and risks related to policy uncertainty and regional conflict could still derail the expected upturn in FDI flows. As a result of higher expected FDI growth in developed countries, the regional distribution of FDI may tilt back towards the “traditional pattern” of a higher share of developed countries in global inflows (figure 1). 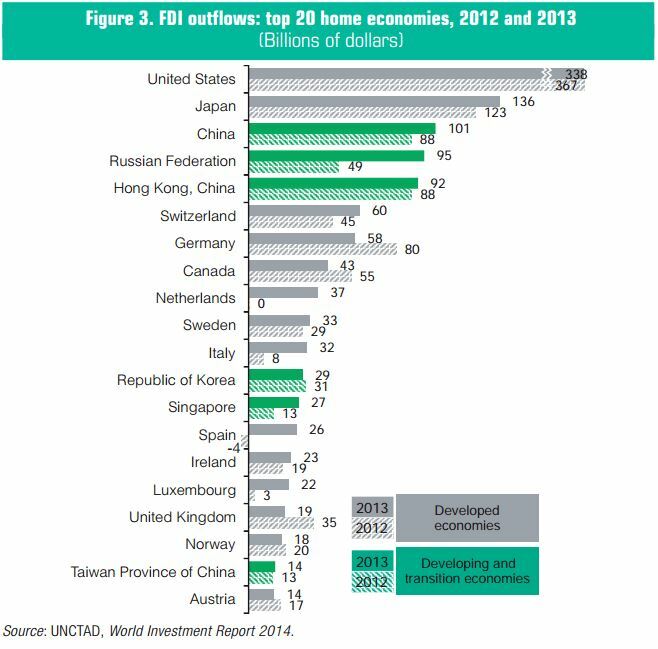 Nevertheless, FDI flows to developing economies will remain at a high level in the coming years. FDI flows to developing economies reached a new high at $778 billion (table 1), accounting for 54 per cent of global inflows, although the growth rate slowed to 7 per cent, compared with an average growth rate over the past 10 years of 17 per cent. Developing Asia continues to be the region with the highest FDI inflows, significantly above the EU, traditionally the region with the highest share of global FDI. 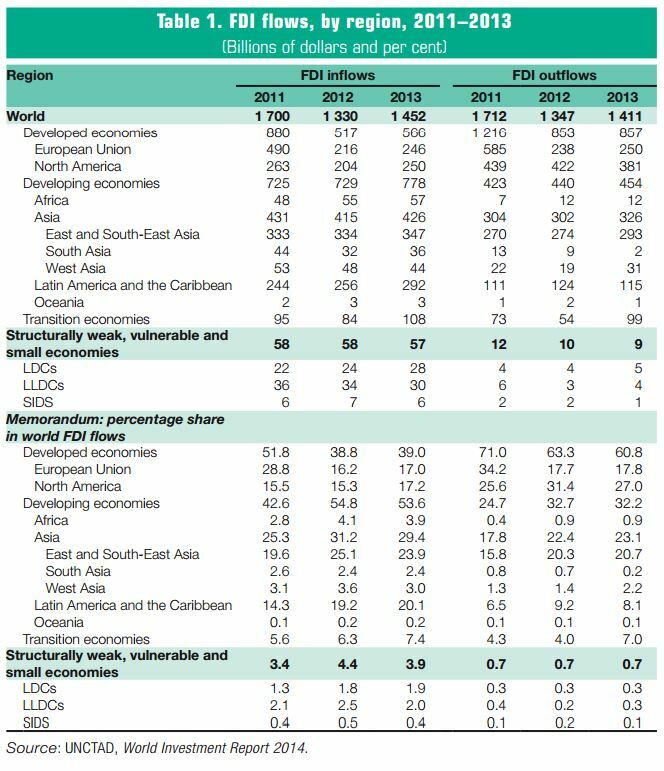 FDI inflows were up also in the other major developing regions, Africa (up 4 per cent) and Latin America and the Caribbean (up 6 per cent, excluding offshore financial centres). Although FDI to developed economies resumed its recovery after the sharp fall in 2012, it remained at a historically low share of total global FDI flows (39 per cent), and still 57 per cent below its peak in 2007. Thus, developing countries maintained their lead over developed countries by a margin of more than $200 billion for the second year running. Developing countries and transition economies now also constitute half of the top 20 economies ranked by FDI inflows (figure 2). Mexico moved into tenth place. China recorded its largest ever inflows and maintained its position as the second largest recipient in the world. FDI by transnational corporations (TNCs) from developing countries reached $454 billion – another record high. Together with transition economies, they accounted for 39 per cent of global FDI outflows, compared with only 12 per cent at the beginning of the 2000s. Six developing and transition economies ranked among the 20 largest investors in the world in 2013 (figure 3). Increasingly, developing-country TNCs are acquiring foreign affiliates of developed-country TNCs in the developing world. The share of APEC countries in global inflows increased from 37 per cent before the crisis to 54 per cent in 2013 (figure 4). 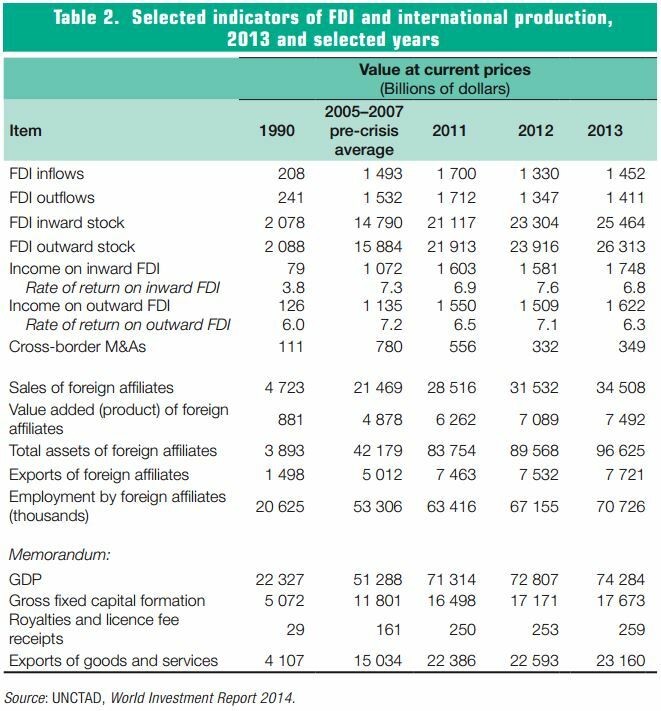 Although their shares are smaller, FDI inflows to ASEAN and the Common Market of the South (MERCOSUR) in 2013 were at double their pre-crisis level, as were inflows to the BRICS (Brazil, the Russian Federation, India, China and South Africa). The three megaregional integration initiatives currently under negotiation – TTIP, TPP and RCEP – show diverging FDI trends. The United States and the EU, which are negotiating the formation of TTIP, saw their combined share of global FDI inflows cut nearly in half, from 56 per cent pre-crisis to 30 per cent in 2013. In TPP, the declining share of the United States is offset by the expansion of emerging economies in the grouping, helping the aggregate share increase from 24 per cent before 2008 to 32 per cent in 2013. The Regional Comprehensive Economic Partnership (RCEP), which is being negotiated between the 10 ASEAN member States and their 6 free trade agreement (FTA) partners, accounted for more than 20 per cent of global FDI flows in recent years, nearly twice as much as the pre-crisis level. Although historically FDI in many poor developing countries has relied heavily on extractive industries, the dynamics of greenfield investment over the last 10 years reveals a more nuanced picture. The share of the extractive industry in the cumulative value of announced cross-border greenfield projects is substantial in Africa (26 per cent) and in LDCs (36 per cent). However, looking at project numbers the share drops to 8 per cent of projects in Africa, and 9 per cent in LDCs, due to the capital intensive nature of the industry. Moreover, the share of the extractive industry is rapidly decreasing. Data on announced greenfield investments in 2013 show that manufacturing and services make up about 90 per cent of the total value of projects both in Africa and in LDCs. The shale gas revolution is now clearly visible in FDI patterns. In the United States oil and gas industry, the role of foreign capital is growing as the shale market consolidates and smaller domestic players need to share development and production costs. Shale gas cross-border M&As accounted for more than 80 per cent of such deals in the oil and gas industry in 2013. United States firms with necessary expertise in the exploration and development of shale gas are also becoming acquisition targets or industrial partners of energy firms based in other countries rich in shale resources. Beyond the oil and gas industry, cheap natural gas is attracting new capacity investments, including greenfield FDI, to United States manufacturing industries, in particular chemicals and chemical products. The United States share in global announced greenfield investments in these sectors jumped from 6 per cent in 2011, to 16 per cent in 2012, to 25 per cent in 2013, well above the average United States share across all industries (7 per cent). Some reshoring of United States manufacturing TNCs is also expected. As the cost advantage of petrochemicals manufacturers in other oil and gas rich countries is being eroded, the effects on FDI are becoming visible also outside the United States, especially in West Asia. TNCs like Chevron Phillips Chemical, Dow Chemical and ExxonMobil Chemical are returning their focus to the United States. Even Gulf Cooperation Council (GCC) petrochemical enterprises such as NOVA chemicals (United Arab Emirates) and Sabic (Saudi Arabia) – are investing in North America. Pharmaceutical TNCs have been divesting non-core business segments and outsourcing R&D activities in recent years, while engaging in M&A activity to secure new revenue streams and low-cost production bases. Global players in this industry have sought access to high-quality, low-cost generic drugs through acquisitions of producers based in developing economies, in response to growing demand. They have also targeted successful research firms and start-ups there. The share of cross-border M&A deals in the sector targeting developing and transition economies increased from less than 4 per cent before 2006, to 10 per cent between 2010 and 2012, jumping to more than 18 per cent in 2013. The availability of vast reserves of overseas held retained earnings in the top pharmaceutical TNCs facilitates such deals, and signals further activity. During the first quarter of 2014, the transaction value of crossborder M&As ($23 billion in 55 deals) already surpassed the value recorded for all of 2013. In 2013, outstanding funds of private equity firms increased further to a record level of $1.07 trillion, an increase of 14 per cent over the previous year. However, their cross-border investment – typically through M&As – was $171 billion ($83 billion on a net basis), a decline of 11 per cent. Private equity accounted for 21 per cent of total gross cross-border M&As in 2013, 10 percentage points lower than at its peak in 2007. With the increasing amount of outstanding funds available for investment (dry powder), and their relatively subdued activity in recent years, the potential for increased private equity FDI is significant. Most private equity acquisitions are still concentrated in Europe (traditionally the largest market) and the United States. Deals are on the increase in Asia. Though relatively small, developing-country-based private equity firms are beginning to emerge and are involved in deal makings not only in developing countries but also in more mature markets. Sovereign wealth funds (SWFs) continue to expand in terms of assets, geographical spread and target industries. Assets under management of SWFs approach $6.4 trillion and are invested worldwide, including in sub-Saharan African countries. Oil-producing countries in sub-Saharan Africa have themselves recently created SWFs to manage oil proceeds. Compared to the size of their assets, the level of FDI by SWFs is still small, corresponding to less than 2 per cent of assets under management, and limited to a few major SWFs. In 2013, SWF FDI flows were worth $6.7 billion with cumulative stock reaching $130 billion. The number of State-owned TNCs (SO-TNCs) is relatively small, but the number of their foreign affiliates and the scale of their foreign assets are significant. According to UNCTAD’s estimates, there are at least 550 SO-TNCs – from both developed and developing countries – with more than 15,000 foreign affiliates and estimated foreign assets of over $2 trillion. Some are among the largest TNCs in the world. FDI by State-owned TNCs is estimated to have reached more than $160 billion in 2013, a slight increase after four consecutive years of decline. At that level, although their number constitutes less than 1 per cent of the universe of TNCs, they account for over 11 per cent of global FDI flows. International production continued to expand in 2013, rising by 9 per cent in sales, 8 per cent in assets, 6 per cent in value added, 5 per cent in employment, and 3 per cent in exports (table 2). TNCs from developing and transition economies expanded their overseas operations faster than their developedcountry counterparts, but at roughly the same rate of their domestic operations, thus maintaining – overall – a stable internationalization index. Cash holdings by the top 5,000 TNCs remained high in 2013, accounting for more than 11 per cent of their total assets. Cash holdings (including short-term investments) by developed-country TNCs were estimated at $3.5 trillion, while TNCs from developing and transition economies held $1.0 trillion. Developing-country TNCs have held their cash-to-assets ratios relatively constant over the last five years, at about 12 per cent. In contrast, the cash-to-assets ratios of developed-country TNCs increased in recent years, from an average of 9 per cent before the financial crisis to more than 11 per cent in 2013. This increase implies that, at the end of 2013, developed-country TNCs held $670 billion more cash than they would have before – a significant brake on investment.